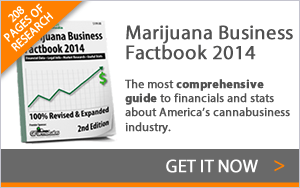 Weedmaps co-founder Justin Hartfield foresees big growth for the company in 2014. The 30-year-old estimates that revenue for the dispensary-listing website will increase 20% over 2013 to crack the $30 million mark. In an interview with the website Mashable, Hartfield predicted that Weedmaps will receive a boost when other states join Colorado and Washington state in legalizing recreational marijuana this year. Hartfield said the company’s growth has created challenges. Due to Weedmaps’ size, it now competes with Facebook and Google in attracting talented computer programmers. Some prospective hires, however, fear that joining the company could hurt their future job prospects. He said the stigma exists despite the fact that he’s never been contacted by the federal government about his business. Hartfield said he also faces challenges with mainstream advertisers who reject his money and pull his ads at the last minute. Hartfield referenced his recent attempt to run a video advertisement in New York City’s Times Square, which was quashed at the last minute when CBS Outdoor pulled his ad.